I finally bit the bullet yesterday and bought a new 60 gallon Husky air compressor to run my paint gun and other various air tools. This is my first large compressor. I now need to run some air lines, and this is where I could use some help. I have decided to use Pex because it is cheap and easy. I want to run a line into my dedicated paint room, and it will have to snake through the top of two door openings. One of the openings is a hall way with no actual door, the other is the door that goes into my paint room. Can’t go through the walls because they are concrete, and I am renting. The owner did say that I could notch the door though. 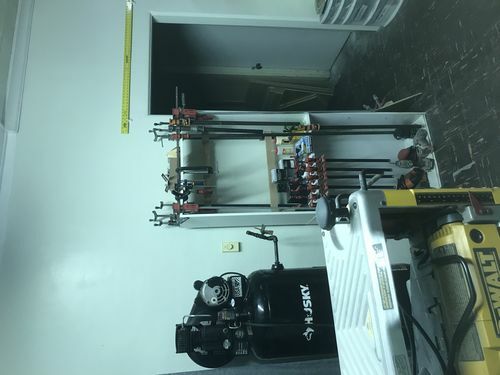 Anyway, my plan is to have a single line (for now) that goes along the back wall of my shop where the compressor is mounted. It will slope down towards the compressor, then it will snake through the top of the two door ways and into the paint room, at which point it will go down to chest level where I will install a “T” for the riser, which will be roughly 6” tall with a blow out valve at the bottom and my dryer/filter/regulator off to the side. Does this sound good? Any suggestions or advice would be appreciated. can ya get us some pics of where the lines are going? off of the compressor and to the line. are you planning on mounting the compressor to the floor? with some rubber pads between the compressor and floor, my compressor was a lot quieter running. I plan to leave the compressor on the pallet it came on. See post below for pics. See that door in the back ground inside the hallway? The line will run through the top left corner of that door, and onto the left side of the wall on room on the other side of that door. I used PEX for the first time to move a toilet supply in our basement. It is so much nicer to work with than copper. I don’t see pex on this list. Do it right with recommend materials. I’m often times disappointed when I do thing cheap and easy. I used Pex in my shop,never again. I installed it properly but it leaks down. Leaks are very small and silent but there are many. Use black pipe,or soldered copper. Aside from metal pipe, such as black iron or galvanized, the only proper air line I am aware of that is a plastic type is ABS. Many shops have their airlines plumbed with PVC and have probably never had a problem…yet….but PVC is dangerous because if it breaks it shatters like glass into big sharp shards that can and will inflict severe wounds or cuts. You definitely do not want to be in the same room when a PVC airline decides to fail. Why not use air hose? It’s fairly inexpensive and designed to hold air. I too experienced this. I went back to soldered copper for 125psi. I recommend black pipe for higher pressures. Each to their own, I went with type M copper and sliver solder. Type M is the thicker walled and is approved for air. Home Depot has it. Silver solder is recommend for fire reason so I read. Higher melting point in case of a shop fire. For safety reasons you should never use plastic pipe for compressed air systems. Use only copper or black iron. if it is a temporary system you could just run a big air hose as previously mentioned (3/8” or 1/2”). True ! I am guilty as anybody but my insurance writer at my previous buisness informed me that a plastic or rubber line that was exposed to heat and failed, would fuel a fire and intenseify it. Why not use air hose? It s fairly inexpensive and designed to hold air.